This may interest some of you. And let me know if anyone has started to profile them. Curious so I checked out their YouTube page. They did a good job of emulating the original series' look. But gosh, it's rather cringey. As was TOS at times. Took me a while to get used to the actors but they grew on me. And some of the guest stars are real pros. I've watched quite a few of these previously and it's remarkable just how well they've done in terms of making them look and feel like the Original Series. Have just 'made' my first BD disc ever, by downloading the ISO files and working out how to turn them into something I can watch. It takes quite a while to burn the files onto the disc, so have only done the first one so far, but it plays perfectly via my stand alone player and TV. Doing this has given me way, way too much happiness! I'm just in the process of watching Star Trek TOS on BD for the first time, so will enjoy watching these straight after. Only downside was that I had to use a 50GB BD disc, as it wouldn't fit onto a 25Gb one. Looks like fun. I am working on it. Torrents downloaded fast, but could they have made the extraction any harder???? As ISOs are already compressed, why one would then zip them is beyond me. And then to use a multipart zip at that ... weird, all that extra time and energy, when using a single ISO file as the downloaded file would have worked so much faster and easier. So now I have to wait for WINRAR to stitch those files back together and then unzip. What a pain! Yes, that was my thoughts about it too. I couldn't understand why they'd been compressed and split up. It all seemed very over-complicated. I used Unpacker to extract and combine each group of files to make a single file and then Windows 10's built in app to extract and copy each to a disc. But have done all four discs now. The cover art files are a total pain. They look beautiful but they're not the right size. Even if you trim the black borders off them first, they still aren't the right size to fit into a standard BD case. Not realising I printed them all out on nice, expensive paper first. So I've now got to trim the digital images first and then resize them all to fit. Expect a rise in the price of Brother shares soon, to mirror the sudden increase in its ink cartridge sales! And don't get me started on the disc labels.. 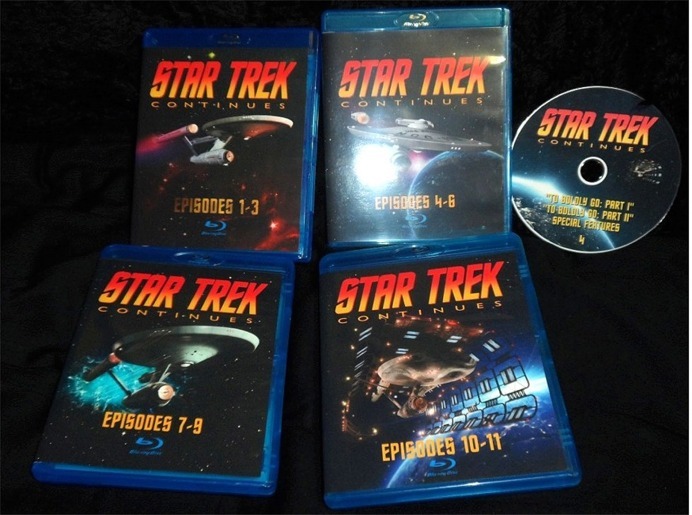 I'm surprised they were able to produce and distribute these episodes (especially in HD) in the first place though, considering all the fuss there's been over Axanar, Horizon, Gods of Men and many other fan-made Star Trek films. CBS seem to either want to ban them entirely, or restrict the length and quality greatly. I love how so many talented people are willing to put so much time, passion and effort into making them though. Oh, thanks for all that good info. Actually, I thought the project was sanctioned, or at least not objected to. Something to think about.